Chomsky has been able to merge deep philosophical/rationalist thought, a good understanding of mathematical analysis and the study of language into a unified theory. It is quite an achievement. Here’s a good page discussing the philosophical backstory: the debate between empiricism/rationalism and Chomsky’s Kantian influence. However, what about Chomsky’s politics? It’s a leftist politics of anti-imperialism, anti-capitalism (the media is an arm of capitalism) and what he calls libertarian socialism (sympathetic to anarcho-syndicalism and quite radical). He has written a stream of political screeds which attack, without necessarily understanding, all that fall outside of their bounds. Despite his depth, Chomsky is uncompromising and does not seem interested in unifying his ideas in such a way that would lend to an influential and applied political philosophy (thus having to account for his ideas in the tradition) and the moral consequences that such political ideas have already had in practice. A reader has suggested to me that it is precisely Kant’s influence (particularly that of German rationalism/idealism) that permits Chomsky to justify his own political idealism. Thus the hubris lies not only with Chomsky (I still find his linguistic theory compelling), but in Kantian transcendental idealism and the idealism of ideas like the categorical imperative. It’s an interesting thought, though I don’t find it tenable. Perhaps a useful thought experiment might run: What if Chomsky was a libertarian statist, or a somehow extreme but irreligious social conservative..attacking the very leftist positions he supports now? Can any political position be necessarily justified by Kant’s thought..let alone Chomsky’s extremism? The burden of proof is on you dear reader…I’m willing to listen. 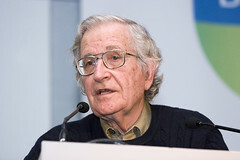 Addition: Chomsky’s position is one that recognizes injustice from a moral perspective, arguing that America has put its interests all across the globe, making deals with sometimes thuggish regimes to promote our interests (sometimes unintentionally so in a fog of idealism or jingoism and sometimes intentionally through military action). From such a moral perspective, all intervention is injustice, and a falling away from that ideal. Yet, the initial reader’s point is exactly this: Kantian transcendental idealism, especially via Hegel and Marx, is easily directed into his communism and socialism (which Chomsky always embraced and in his later years supported through ridiculous hubris)…and is at the heart of this problem, and Chomsky is a good example of it. Another Addition: The Kantian transcendentally ideal influence may well lead to a kind of liberal political philosophy. See Also On This Site: Martha Nussbaum criticizing Chomsky’s hubris in Martha Nussbaum In Dissent–Violence On The Left: Nandigram And The Communists Of West Bengal…Jesse Prinz is trying to lead psychology and the cognitive sciences toward British Empiricism and away from Kant..A Brief Review of Jesse Prinz’s ‘The Emotional Construction Of Morals’ add:(and incorporate moral relativism and a strong Nietzschean influence). I grant you the fact that Chomsky is basing his moral theory on neo-platonism, kantian transcendental idealism, and its seeming manifestation in our language capacity as proof of the soundness of such philosophy. I look at this as a leap of faith and believe he should always be criticized for it. Chomsky is interesting in this way because he raises so much food for philosophic thought. But I think you’re wrong in asserting that Chomsky has shown support for particular socialist or communist regimes either ideologically or philosophically. The self-described core of chomskys political ideology has consistently been found in the philosophy of anarchism. No root in any communist group in history. He often expresses his critical views on such groups of the past and the way they operated. Other than the innate capacity of language chomsky has two other weapons in his arsenal which are always motivated by idealism: the history of political regimes and their fate in the factual world, and his isolation and evaluation of specifically american led, or fundamentally american backed foreign policy ventures. A proper criticism of Chomsky would require balancing the factual history out and weighing it with other points of view other than idealism. Chomsky, I will admit, is very uncompromising in this respect. In the end, at least he does not suffer from communist nostalgia and should not be discredited in that way. Your thought experiment is the key. Barber, thanks for reading, commenting, and clarifying. So perhaps his idealism may have no roots whatsoever with any communist or socialist group. That seems important to point out. I was perhaps broadly attacking the idealism itself that has a lot in common with the intellectual roots of both movements (via Hegelian historicism at least). Also, if I disagree with Plato’s metaphysics, I can still be quite impressed and challenged by the Republic. With Chomsky, he’ll likely be remembered for his theory of language. How seriously can you take the criticism of a profound anarchist, uncompromisingly firing away at his favorite targets for decades? Communism and Socialism we’re products of idealism theoretically, I agree. The criticism I have with Chomsky is he scolds communists and socialists for their abandonment of true ideals, while spending his whole life denying the fact that idealism hits the roadblock of human nature, like you say. I don’t think we’re in disagreement here. Although Chomsky is expressing that, philosophically, anarchism may have more potential and should be explored. We both understand how impractical that seems in reality. Chomksy has consistently denied being aware of ANY CONNECTION between his language theories and his political work. He has asked anyone who can find such a connection to bring it to his attention. I would like to add that, despite my background in philosophy, I cannot discern what you are arguing for or against here. It’s sound like stream of consciousness, not a coherent argument. 1. Much as the categorical imperative demands that the moral law be found not in actual experience but within our a priori reason as Kant defined it, so too does Chomsky ground his linguistic (universal grammar) metaphysics in Kant’s search for how a priori synthetic reasoning is possible. 2. The radical empiricism of Quine, for example, argues that the analytic/synthetic distinction is unnecessary and could work to undercut Kant’s project, and perhaps Chomsky’s. 3. Chomsky’s political philosophy, albeit not directly related to his metaphysics, similarly had roots in the Kantian synthetic/analytic distinction and Kant’s project via Hegel, German Idealism and Historicism via Marx via Chomsky’s anarcho-syndicalist and libertarian socialist leanings. Chomsky seems somewhere in the liberal political tradition but probably on the extreme end, sharing with Kant, Locke, Hobbes, Mill, Rawls etc. some liberal Enlightenment positive defense of liberty. Chomsky, though, is very skeptical of any authority, and any interference with the individual’s ability to reason and think and act for himself. He puts the burden of proof upon any organization, goverment, institution etc. seeking to impose its will upon the individual to justify the imposition. Ideally, as Chomsky might have it, individuals would freely enter and leave contracts and arrangements of their own accord, an ideal form of organization being alternately: a faculty, or some community of individuals…thus shunning corporate tyrannies, military hierarchies, fascist dictatorships, and the promotion of democracy by force and injustice (as Chomsky applies his defense of individual liberty to all humanity). Thus, all the various forms of human organization and individual behavior we actually experience are inadequate in the face of this definition of positive liberty. Kant seems to make it clear that the State is a means to achieve human freedom, making anarchy not really tenable. I like that bit about the Marshall Plan towards the end of the video. Elsewhere I have read (in fact, I referred to this fact in a draft I am working on) that Chomsky has been very critical of it on grounds that it essentially funded French imperialism in Indochina, and Dutch imperialism in Indonesia, both leading up to very bloody conflicts. But, I can still understand why he, as a socialist, might make the case that it was arguable on economic grounds, all other things being equal. I wish I could comment on Kantian Transcendental Idealism, but as much as I study all that stuff I can’t seem to keep it all straight. Henry, thanks for reading and commenting. Something’s got to fund ‘imperialism’, and it couldn’t ever be the leadership of those elected in a Constitutional Republic and a representative democracy. Chomsky is almost pathologically critical of anything that leads back to an American leadership that he philosophically may disagree with. He’s a socialist up to a point, but he’s also a libertarian socialist, so he has a strong defense of the individual and an anarcho-syndicalist (the scene with Dennis from Monty Python’s Holy Grail has a comic portrayal of such a figure). I certainly haven’t made a case in this post that Kant’s transcendental idealism has direct correlation with Chomsky’s thinking, but Chomsky is a rationalist. Kant was really trying to get around David Hume’s problem of induction, and find the terms with which to answer Hume. It’s not a bad blog! My brother visited India and I’m curious about the place, too. Yup. . . . Pretty well sums up incredible India! How long was he there? Did he get to travel? More people in India than all the people in North and South America combined!! Honking lot of people. Namaste! @ chr1: I think you are overstating the issue – his political commentary over the decades has been much more modest. A large majority of what he says are pure facts that contradict dominant narratives and expose hypocrisy. And you are right that there is very little in the form of political theory from his pen but we should find him useful mostly due to his vast knowledge of facts and his quickness in pointing out hypocrisies of the prevailing ideology. I agree totally concerning Chomsky’s linguistics, he essentially invented modern linguistics. But concerning Chomsky’s politics, I disagree with a lot of the article and many of the comments made. Chomsky is a libertarian socialist, a ‘child of the Enlightenment’, his real inspirations are Adam Smith and empiricists like David Hume. the more libertarian sides of Rousseau and Kant, like them he sees that human’s have what he calls an ‘instinct for freedom’ and he’s also inspired to have a positive view of human nature through Kropotkin’s Mutual’s Aid, which appears on his reading list -(https://leftreferenceguide.wordpress.com/noam-chomsky-reading-list/). Yes, he’s sympathetic to anarcho-syndicalism and believes its the most adequate and relevant form of society for the industrial and post-industrial world to consider. In ‘For Reasons of State’ (1973)’, specifically ‘Notes On Anarchism’, he quotes Bakunin, Marx and Humbolt. He holds that if Humbolt was consistent, he would have been an anarcho-syndicalist today. While more critical of Marxists and Engels in that particular essay, in general he sees his own political position as not too far away from anti-statist Left Marxists like Rosa Luxembourg and Antonie Pannekoek, who, like him, were very critical of Marxist-Leninism and the Soviet Union. Nonetheless, at talks he rarely discusses anarchism unless specifically asked about it or most of his talks concern corporate power in the US or US foreign policy, which as a US citizen, he holds that Kantian believe that he has the right and the obligation to criticize. His position is not that idealistic in some senses, his recent talks have concerned two of the threats of species survival – nuclear holocaust and environmental disaster. It is rational to hold that the rate we are going as a planet so far, these are two things which could happen, but a development of environmentally-friendly, nuclear disarmed societies with government developed from below could save the human race. Thank you very much for such a knowledgeable and insightful comment. I agree that there is some level of influence from Kant on Chomsky’s linguistic views. Chomsky actually goes beyond Kant, as he had already known about the views of Quine, etc. : Chomsky was trying to explain the possibility of a priori truth in a way which wouldn’t have the same weaknesses as Kant’s explanation. Forms of experience and a priori judgements, for Chomsky, are limited to the level of the linguistic. “X = X,” for example, is an a priori true statement. It seems that Chomsky attributes the possibility of this a priori knowledge to the fact that humans can be-in-language: language is then revealed as an a priori form or mode of reason which allows us to create a priori true conclusions. In this sense there are similarities to Kant’s transcendental idealism. Also relevant is Putnam’s essay “There is at least one a priori truth,” as well as Wittgenstein’s Tractatus, but I won’t get into that here. However, in no way are Chomsky’s political views influenced by Kant’s. The confusion here seems to be a possible misinterpretation of the concept of “idealism.” This does not in any way denote a political idealism: the world is ideal for Kant in the sense that all representations and perceptions of the world are essentially ideas and not material objects (we can never perceive the world in-itself): hence the world is transcendentally ideal (“transcendental” just refers to the existence of prior necessities which must exist for there to be a world at all, while “ideal” refers to the notion that all perceptions are ontologically mediated via the forms of perception and hence are really “ideas”). It also wouldn’t make sense to claim that Chomsky’s politics are influenced by Kant by way of Hegel and Marx. All of the relevant influences from the two are already very far removed from Kant’s political conclusions. Hegel thought that the Prussian state in which he lived was a representation of the “end of History” (essentially the apex of the whole of human society, a utopia). Marx started as a Young Hegelian meaning he believed in Hegel’s view of Historical progress but did not believe that History had ended. Marx then materializes Hegel (i.e. he gets rid of the idealist elements) and claims that the end of History would be represented by a unified, free, anarchic communist society. Chomsky’s politics are certainly influenced by Marx, but not so much by Kant himself. There are so many details I could add here, but I won’t. I can get more descriptive about anything unclear if anyone would like. I also run a blog with a few friends. Feel free to check it out: randomphilosophyy.blogspot.com. It is not the most rigorous, but just some fun ideas. I recommend the Theses on the End of History and the Theses on Divinity. Thanks very much for comment and the link. It’s appreciated.